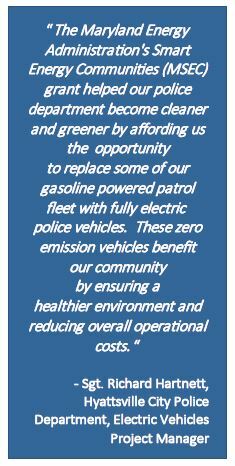 The City of Hyattsville has been a Maryland Smart Energy Community (MSEC) since Fiscal Year 2013, adopting the energy efficiency and petroleum reduction goals. The overall goal of the Maryland Smart Energy Communities (MSEC) program is to have local governments adopt energy policies and commit to them for the long term, leading to sustained energy savings and additional opportunities for renewable energy development. 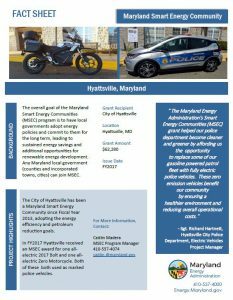 In FY2017 Hyattsville received an MSEC award for one all-electric 2017 Bolt and one all-electric Zero Motorcycle. Both of these both used as marked police vehicles. Click link to the right to download the full fact sheet: Hyattsville MSEC Factsheet FINAL Any Maryland local government (counties and incorporated towns, cities) can join MSEC. To learn more about MSEC or to become a MSEC community click here.